Vintage charm and private cabins make Nelson Gay House an ideal spot for a wedding or family reunion. The size of the living areas will accommodate a large party for visiting or formal dining while the small separate cottages and bedrooms (with their own en-suite baths) will afford some privacy. During the day, head down to the beach to sunbathe, or take the crew snorkeling on the coral reef. 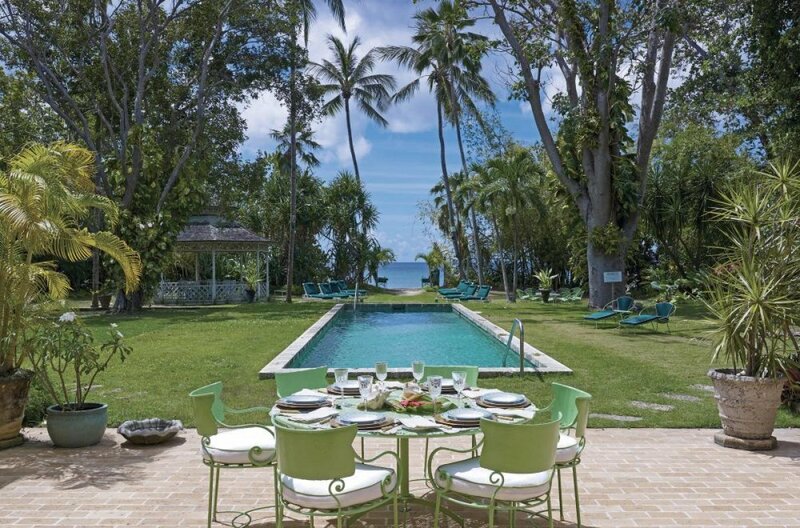 In the late afternoon, hold a barbeque on the back lawn where the adults can visit while the kids swim and play. After dinner, tuck the little ones in and enjoy cocktails on the patio while the sun goes down over the Caribbean. Beachfront & Perfect for family holidays! Further outside is a charming chattel house cottage, as well as an elegant garden gazebo complete with a wet bar. Two covered terraces on the north and south wing bedrooms offer additional privacy and comfort, while on the seaside, a large area in front of the house is roped off with buoys for safe swimming. By special request, the villa is transformed to accommodate 18 guests. Please contact your WhereToStay.com representative for Christmas/New Year’s availability and rates. pool size 50 ft. x 12 ft. x 4.6 ft. deep, Stunning, heated (by request), Italian mosaic tiled swimming pool which can be fenced off. Beachfront and has a beach shower as well. Welcome. Portable crib with mosquito net available for guests. Any additional guests beyond 12 will incur an extra weekly staff charge of US$300. Special arrangements can be made to sleep up to 18 guests in total using the chattel houses and media room. Each room is an additional $100 per night plus VAT. Nelson Gay has it all. A warm inviting space both inside and out. We were able to relax by the large pool, go snorkeling right outside the gate in calm waters, walk into Speightstown or to Mullins Bay, and use the facilities next door at Cobblers Cove. Each bedroom was well appointed, two had their own private patios. The grounds were spectacular, with mature fruit and palm trees, and bamboo where monkeys would sit and sway in the wind! The size and scope of the yard set this villa apart from the others. Nelson Gay has the feel of a loved home, with personal touches throughout. The staff was warm and professional.. The chef even made us lunch to take with us to the airport! The chattel houses are adorable and can be used for large groups, great for families. Speaking of families, the house has snorkeling equipment and boogie boards, and lots of games and books, a media room and a Sonos system for music. We highly recommend Nelson Gay. We never have any issues with Andrew, a pleasure to work with. $1000 Food & Beverage Credit! Good for stays from Apr 27, 2019 to May 1, 2019. Escape to Nelson Gay and receive $1000 in food and beverage credits! Good for stays from May 11, 2019 to Jun 1, 2019.